Histamine is a biogenic amine that is counted among the so-called tissue hormones. This substance is relevant for many physiological and pathophysiological processes in the human body. Among other things it is an important mediator for inflammatory reactions. Histamine is found almost everywhere in the human body, i.a. in the skin, lungs, the mucous membrane of the gastro-intestinal tract and the hypothalamus. Also, food contains significant histamine concentrations. Some plants use histamine as a substance for defense (e.g. stinging nettle). Histamine arises from decarboxylation of the amino acid histidine in the human body. The conversion is catalysed by the enzyme histidine decarboxylase (HDC). Histamine is metabolised to n-methylhistamine by histamine-n-methyltransferase (HNMT) or converted to imidazole acetic acid by diaminooxidase (DAO). In cells that contain higher doses of histamine, e.g. mast cells, histamine is being stored intracellularly in vesicles, in which it is bound to heparin. Histamine is a potent mediator, which triggers many consecutive reactions in the organism. It unfolds its effects via bonding to membrane-bound histamine receptors, of which there are 4 known ones, H1-, H2-, H3– und H4. The most import pharmacological effects which occur in several tissues due to activation of the receptors are as follows. Histamine triggers via the H1-receptor vasodilatation and an increase of the vascular permeability of the blood vessels. Due to the vasodilatation the arterial blood pressure falls and the generation of adrenaline increases. Another arising effect is the emergence of edema (skin and mucous membrane). Typical abnormalities in the skin due to histamine are swellings, redness/flushing and itching. When it comes to migraines or other headaches the vasodilating effects of histamine may play a role, too. In the bronchi histamine, also via the H1-receptor, leads to bronchoconstriction. Histamine therefore is of special importance for understanding the allergic bronchial asthma and its pathophysiology. Histamine induces a higher secretion of gastric acid via stimulation of the H2-receptors of the parietal cells of the gastric mucosa. In the central nervous system Histamine operates as a neurotransmitter. It influences also the release of other neurotransmitters via presynaptic H3-receptors. It has bearing on noradrenergic, serotoninergic, cholinergic, dopaminergic and glutamatergic neurones. The diverse effects of histamine in the body are the subject of intensive research and are not fully understood as of yet. Among other things histamine is involved in inducing vomiting and it also is involved in the regulation of the sleep-wake cycle. Definition: Histaminosis or histamine intolerance are general terms for excess histamine in the body (locally or systemically) that disrupts the well-being or the physical/mental functions. Different from an allergy, there are no antibodies involved in histamine intolerance. There are problems in breaking down histamine, therefore symptoms occur. The term histamine intolerance, refers to a dysfunction in breaking down histamine due to a deficit in diamine oxidase (DAO). Not only DAO (diamine oxidase) but also another enzyme HNMT (histamine N-methyltransferase) is involved in breaking down histamine. The following graphics show that also MAO (Monoamine oxidases) play a minor role in breaking down histamine. Due to the different enzymes operating at several spots in the body to break down histamine there are different forms of histamine intolerance – with different causes and cances of recovery. As of today the exact causes of histamine intolerance are still controversially disputed, especially because there appear to be various types of this ailment, depending on which histamine-receptor/s is/are affected (see above), also depending on if one was born with it or not. In any case, there is dysfunction in breaking down histamine. Read here more about possible causes. If one is born with histamine intolerance it can last for a lifetime. In that case one will try to eat food low in histamine lifelong. This form usually is treatable, but not curable. A dysfunction of HNMT can be caused by chemical influences (environmental toxins), it is then usually only temporary and therefore can be cured. Mast cell activation disease must be considered as a possible cause, too, especially when symptoms linked to the organs named above are featured. With a DAO deficit symptoms linked to the central nervous system are rather rare. DAO is an excretory (= releasing to the outside) enzyme, that is mainly being produced and discharged by cells of the intestinal mucosa. It degrades histamine already in the bolus/food that has been taken in, before it “hits” deeper in the body. HNMT on the other hand is degrading histamine in the body cells, especially in the kidneys and the liver (detoxication). Due to the spatial and functional “labour devision” when it comes to histamine (enzymes active in different organs, in the cell and outside of the cell) it is likely that one enzyme is not fully able to substitute the other in case of a deficit. Among other things, pre-existing conditions, especially when bacteria were/are involved or metal pollution, are possible causes for histamine intolerance. If the affected person is treated respectively detoxicated and if the diet is strictly low in histamine for a while this kind of histamine intolerance can be overcome. Sometimes the root cause can be found quite easily in the mouth. Nowadays outdated amalgam fillings can intoxicate the body, if the filling on top of that is carious the bacterial involvement will make it worse. Other influences that might lead to histamine issues are antibiotics that destroy(ed) the gut flora. Furthermore if the hormonal balance is off this may cause histamine issues, too. The biggest role here presumably plays oestrogen. The amount of oestrogen is not crucial, but rather the balance between oestrogen and other hormones, such as progesterone, testosterone, is decisive. Women are more prone to this “hormonal” type of histamine issues. Considerably more women than men are affected and histamine intolerance often occurs first with the beginning of menopause. The intensity of histamine issues depends on the female cycle (menstrual cramps as a histamine symptom). Afflictions of people sensitive to histamine can worsen OR better with hormonal contraception depending on the individual hormonal balance. During pregnancy the DAO-level approximately rises to 300 times of what it was before to protect the embryo from histamine. With the effect that during pregnancy allergies and other histamine issues seem to improve. For the degradation of oestrogen vitamin b6 is needed. If excess oestrogen has to be degraded it might be there is not enough vitamin b6 available for DAO and histamine degradation. Vice versa the histamine level also influences the hormonal balance. It is possible that not only DAO is affected hormonally, but also other processes of histamine degradation. Histamine can be released from mast cells in the body and it can be taken in with food. A healthy body is able to break down histamine, so usually no problems occur. However, if the body is confronted with many histamine sources and unable – for whatever reason – to break down the histamine, then the histamine level rises in the body. (Some people tend to speak of “their histamine bucket” that can overflow.) If the individual tolerance threshold is surpassed (the bucket overflows), symptoms occur, often resembling symptoms of poisoning. One symptom might be rashes, similar to an allergic reaction, but also migraines or other headaches. 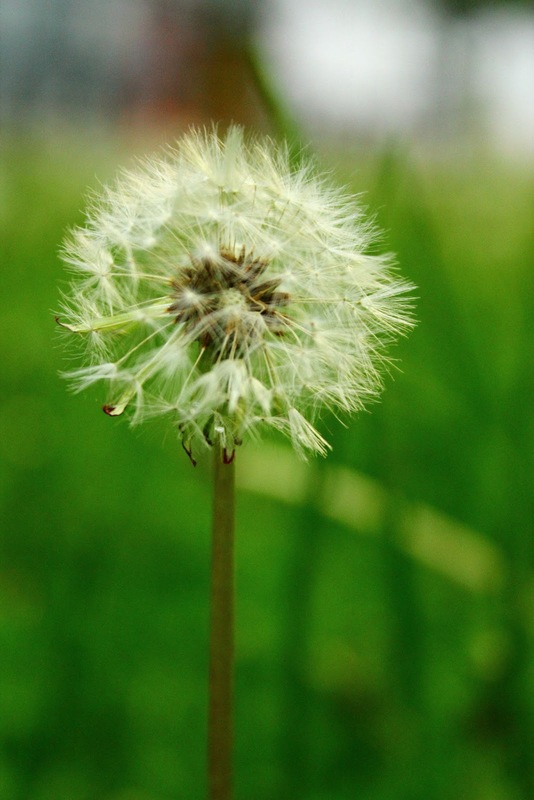 The similarity in symptoms lead to the term pseudoallergy. Different from an allergy, there are no specific IgE antibodies involved in pseudoallergies. Histamine is not any poison in the general sense. This is also important so one will not be afraid of supposedly “toxic” food. Histamine is one of the body’s own neurotransmitter with several functions as described above. In people affected by any kind of excess histamine the regulation of these processes is disturbed. There are several causes of histamine intolerance. Furthermore the kind of histamine intolerance – more DAO or HNMT – is important for the individual cluster of symptoms. Often the first step after diagnosis is a dietary change (low histamine foods). I hope I can help you with this. Please feel free to get in touch with other people affected via this website. My main goal is it to gather yummy recipes here that will help people who got hit with HIT. Most patients are advised to omit high histamine foods once they got diagnosed with histamine intolerance. But this is usually where the problem starts. When having a common allergy then one just omits, say nuts. Products nowadays have to reveal allergens like nuts. Also vegetarians can now often find products labelled as “vegan” or “vegetarian”. But with histamine intolerance it is no allergy and certainly not only one food or only one food group. That would be the case for people suffering from lactose intolerance, who have to avoid all dairy products. Moreover the body itself produces and releases histamine, because it is important for many processes, e.g. the sleep-wake cycle. Histamine is also being released in the process of digestion. How do I find histamine in food? How do I know if histamine is in the food? Well, actually very few foods are completely free of histamine (e.g. pure substances like water, salt or sugar). Apart from that, many foods contain histamine – sometimes more, sometimes less. Furthermore there are so-called “DAO blockers“. Nicotine is such a DAO blocking substance for instance. So smoking can be an issue when having histamine intolerance. The detective work – finding the histamine offenders – is something everybody has to do individually. Not everybody reacts the same way to every substance. Certain food lists, though, can be very helpful, especially to get started. They give you an idea what the histamine “suspects” might be. The Swiss organisation SIGHI tested a lot of foods on those affected by histamine intolerance and they also determined the histamine concentration in some foods. Here is the list. The actual histamine concentration in food depends also on how it was produced and how (long) it was stored then. Food that needs long to ripen (like parmesan for instance), that was warmed up again (leftovers reheated), that goes bad easily (e.g. fish) or overripe food (especially fruits) should be avoided. Besides food lists concerned with the histamine potential or concentration in food, lists concerned with the histidine concentration can be helpful, too. This is because histidine is a precursor in building histamine. Histamine develops through unspecific L-amino acid decarboxylase respectively through specific histidine-decarboxylase that is present in many tissues. Fish, which contains a lot of protein and a lot of histidine can develop high histamine counts fast. It is important to gut the fish as soon as possible since the bacteria in the gut are the main cause for transforming histidine into histamine. Histamine develops also easily in other foods which need microorganisms/bacteria for ripening, e.g. Sauerkraut or cheese. When it comes to the histamine concentration in food freshness is the essential thing. Histamine is the result of spoilage. Histamine develops in huge numbers when spoilable foods that contain a lot of the amino acid histidine (e.g. fish) are colonised with bacteria and yeasts. But histamine can also develop during intended fermentation and ripening processes. What is actually intended to make the foods longer-lasting and more aromatic (e.g. Salami, cheese, Sauerkraut, wine, beer) drives up the histamine count aswell. In the course of longer storage the histamine concentration can increase, too (e.g. canned food). Depending on individual sensitivity symptoms might not occur until several high histamine foods are combined (e.g. cheese with red wine). Also “healthy” people can develop symptoms depending on the dose. Almost everybody knows the typical feeling/headache after drinking an adulterated wine. Often it is not the bacteria that cause problems in the gut but the biogenic amines that are being released because of them. DAO is partly also in charge of breaking down other biogenic amines (besides histamine). A minor part in degradation plays the MAO. Other biogenic amines are rival to histamine when it comes to DAO, actually it is even worse, because DAO prefers other biogenic amines than histamine. 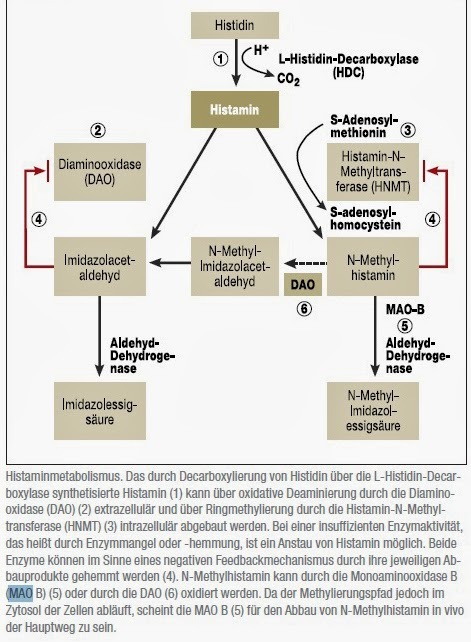 The degradation of histamine slows down significantly when DAO is already occupied with breaking down other biogenic amines. The selection of low histamine food is one thing one might look out for the other is to be aware of preparation and storage of the food. Freshness, again, is the important factor here. There should be no interruption in the cold chain when buying or storing deep-frozen goods. I do not recommend slow defrosting (e.g. in the fridge), because this leads to more histamine again. Avoid finished products or products that only need to be warmed up, e.g. breads that need to be finished in your oven. Many people cannot tolerate the inherent preservatives. Besides, the cold chain can often not be guaranteed during transportation. Look out for certain food additives (e-numbers in Europe). Alcohol, vinegar and other substances (often of preservation) are being masked by those cryptic names or numbers. When preparing meat, fish, vegetables or fruits (also from your own garden) make sure to wash it first. Histamine is temperature-resistent. It cannot be destroyed by freezing or heating up, but it is soluble in water. Therefore I recommend to drink enough water at meals. Do not use pickled or canned food. Do not warm up food again. If you want to use leftovers, freeze as soon as possible after cooking. Sometimes symptoms occur and sometimes they don’t, although one is eating the same meal. This is a special challenge with histamine intolerance. The histamine concentration depends on how the food is prepared and stored. Beware: Sometimes it is hard to notice the effect of histamine triggers and other biogenic amines, because they often appear delayed. Once you started a low histamine diet over time it will get easier. You might also be able to add more foods to your diet again (once your “bucket” was emptied). You might have reacted to one thing in the beginning and therefore eliminated it from your regular diet, sometimes it is worth trying again after several months. Please be mindful about a balanced diet respectively consult a dietician! After being diagnosed with histamine intolerance the first step will be to start your own food diary/journal. Here you can find information on the elimination diet, challenge test and more. You have been eating according to the elimination diet plan respectively according to your individual food list for awhile now. Maybe it is time to test high nutrious foods you once eliminated. Please try in small amounts! Once the “bucket” is empty, the histamine strain on the body decreased, some foods are tolerated again. The following is my personal food list that I also use to prepare food at home. You will find some explanations in the list aswell. Another list many people affected by histamine intolerance recommend is the one by www.histaminintoleranz.ch. You can download the PDF-file by SIGHI here. My list resembles the SIGHI-list (with some differences). You can use both for inspiration. dairy products: hard cheese like parmesan, matured cheese camembert, cheddar cheese, Harz Mountain cheese, Emmental cheese (watch out for smelly cheese and for cheese with big holes). Generally prefer young cheese and dairy without bacteria strains, meaning sour cream, buttermilk and many yoghurts are to be avoided. nuts and seeds: most nuts, peanuts (actually they are legumes), cashew nut (only small amounts), walnut, pine nut, poppy seed only in small amounts tolerated, almonds (only small amounts), pecan nut? oil: peanut oil, also pesto alla genovese is to be avoided due to parmesan (and pine nut?). fish: (fresh or deep-frozen) cod, trout, pollack, salmon, plaice and many other species, do not defrost slowly, some kinds of sushi and maki from an Asian restaurant you trust or if you made it yourself (freshness!) are tolerated (e.g. cucumber maki). fruits: blackberry, apple, apricot, cherry, blueberries, lingonberry, gooseberry, currant, coconut, seabuckthorn (not when allergic/intolerant to sorbitol), white grapes, no overripe fruits! oil: oils for frying: coconut and olive oil, others not for frying: thistle, hemp, linseed. Sunflower seeds are triggers/liberators and therefore sunflower oil should also be avoided. Pumpkin seed oil is suitable for salads. I post tips on special topics on a regular basis. You can find all tips by clicking on the category “tips” on the left side. X-ray contrast agents: iopamidol, amidotrizoic, iopodate, etc. Always inform your doctor (when having surgery, x-rays or other scans, etc.) and your pharmacist (when buying medicaments) about your histamine intolerance! A tea from khella can work preventive against histamine reactions (bot. ammi visnaga). The seeds and leaves of the plant contain varying amounts of khellin which is a mast cell stabiliser. Grow your own or ask in a pharmacy for it. A tea from Baikal skullcap can block the histamine release. It is therefore a natural antihistamine. Other natural antihistamines for instance are basil (especially tulsi) and oregano. When using herbs please watch out if you suffer from allergies, also check for possible allergic cross reactions to food. Stomachic herbs help to digest food better, so that the gut does not overacidify. Southernwood (bot. artemisia abrotanum) is great to meat. Caraway seed (carum carvi) can be used in several foods, e.g. to potatoes or rice. In case of a histamine shock taking medicaments can often not be avoided. For first aid it can be helpful to dab the affected person with a wet, cold cloth, especially around the neck. This might soothe the temperature, sweating and shivers that often come with a histamine reaction. The scent of cloves can have painkilling effects and it may soothe nausea. Please let me know what helps you. Feel free to leave a comment. I’m always trying to add useful information to this page. So much useful info in one place. …thanks for putting this together! I agree this is excellent. You may want to post resources for those who need more information or just need to convince others to realize how credible this all is. On a skale of 1-10, 10 the best I have to say its an 11 with everything I have been researching, but the resources I would love too. Thank you and bless you for doing this, it gives a better understanding and explanations than most of the specialists and professionals I have dealth with. thanks. Most of it can be found in this paper: http://www.data.aerzteblatt.org/pdf/di/103/51/a3477e.pdf by Maintz et al. Since the whole blog started out as a private project, I didn’t design it like I used to write my diploma thesis. Now, that I’m writing my first book (in German), I start to regret that, as I have to pick up the sources all over again, as a book should be intersubjectively understandable and reliable. Right now I have some 50 to 100 papers stored in my computer that are somehow directly or indirectly concerned with histamine and mast cell issues, but also reaching out to other problems which are somewhat related, e.g. atopic dermatitis, psoriasis, allergies, etc. Some stuff about fluoride and so on. If you wish to have a further reading on a particular topic,you can e-mail me. Then I can provide you with more material, if you like. Thank you for the comprehensive information provided. An irritated throat I have had for over a year is nearly gone. My stomach much better Issue of food freshness was new info for me, and very helpful. Thanks again. Thanks this was an eye opener for me, I hope to feel a lot better soon. All the best for you! Hope, you can improve your life and feel better. Completely useless list. I have definite histamine intolerance, but your list is extremely limiting and, I think, produces more fear from food, which is wholly unhelpful. People should follow Healing Histamine by Yasmina Yelkenstam for the most healing. I encourage anybody to create their own list. Everything else is senseless. I follow and cherish Yasmina’s page as well (it’s in the links). Yasmina suffers from mast cell activation which is not the same as histamine intoleranc, though similar. Glad if her advise helps you cope. To diminish other approaches should not be the way to go, as i believe everybody sharing his or her experience with histamine issues makes the associated illnesses better known. Plus: I haven’t updated the list in a while now. Useless to you perhaps, Cheryl, but clearly not to some others. The area of histamine intolerance is complex and there is no one-size-fits-all – individual differences are very marked. It’s not that green and red anyway when it comes to “food lists”. the amount of foods, the kind of preparation (boiled, raw, fried …) and combinations – this all plays a part. Some red marked foods are well tolerated in small amounts or better tolerated when combined with vitamin c rich foods, etc. Individual allergies and other intolerances (if there are any) play a role, underlying other illnesses or problems like SIBO do influence this as well. Especially when stuff like SIBO is identified as underlying problem and this is tackled correctly, there is a good chance, your tolerance goes up again. After a while many people therefore can include more foods again. It’s always important to watch out for defiencies and therefore not too eliminate too much. I actually tried to substitute rather than eliminate and should really update the list so it will reflect this more. Totally agree! I’ve been following this diet for the last 2 months and while it’s not easy (at first) I have seen a VAST improvement in my health which makes it 1000% worth the effort. Excellent tips here. Thank you and all the best for your histamine-journey! I’ve recently discovered your website and find it extremely useful. I do have a question regarding the natural antihistaminika vitamine B6 and C.
It seems to be that a lot of soureces containing these vitamines are just the things that I cannot eat. Do you know of a good source of those vitamins which I who is histamin intolerant can eat/drink? Apparently rose hip is a great source of vitamine C, but can I tolerate this? Thank you ever so much and thanks for your website! rose hip does not work here. I don’t know if you can cope with it though. But it might be a problem. You are right, that lots of supplements for vitamin c and b6 are actually made of stuff that is bad for people with histamine issues. So, you are right, you should not use those. Did your doctor check if you actually have a deficit in vitamin c or b6 or other vitamins, respectively minerals? Before applying any supplements I would have this checked. Once you are at that, let them check copper and iron as well. We try to get our “dose” of vitamins and minerals through food. I’m not a fan of supplementing unless you have to. Try small amounts of herbs for example to test if you can tolerate them. Parsley is a great source of vitamin c for example. I always try to add good herbs to the food. Another great way is tea. But try this first. Tulsi (holy basil) is great, but also sage for example. Just try small amounts first. Let me know how you get on with all this. Hope I could help. Vitamin C made from Sago palm is the best for histamine issues. It took me a few years to find this out. Hi, I read always to inform your doctor and pharmacist about histamine intolerance… But they never heard about it… what a mess my life… Belgium is not the place to live with HIT! I don’t know what to do anymore! This might also be interesting for yourself to read. Until you find someone who knows about HIT try to keep a food diary. very good information. i am definitely going to use this for my son who has hives every three days, right on the schedule! This is a very helpful page. I’m surprised more people haven’t discovered it. I’m always searching what others can tolerate in hopes that one day that will be me. Thank you for sharing such great information. Thanks, Cory. As this is just a personal blog it is not as well known as other sites. I’m always happy when it can help someone else as well. And same here, I like to hear stories of other people and how they get along with histamine intolerance, what they can tolerate and what helps them, etc. Last Friday I was diagnosed with Hystamine Intolerance after 15 years trying to control my type 2 diabetes, and nothing seeming to work. I went to an Orthomoleculair therapist and had my gut biome assessed. My igG and IgG4 counts for nuts were off the chart. I was looking for the hystamine content of Macadamias when your site turned up. I immediately book marked it and hope to learn a lot on this site. Thanks for the input. I actually read of Dr. Janice before at the Low Histamine Chef, but this link is new to me. Will check it out later, thank you. All the best for you. Hello you say not to slow defrost meats so how do you defrost your meat once you take out the freezer? Hey Moe, we are not eating any meat any more, but fish once in a while. I put the frozen fish on a soup plate in the sink and pour warm water over it to defrost it faster. I’ve had bad experiences with defrosting in the fridge or at room temperature. The way described above does not produce so much histamine in the food. In order to freeze leftovers don’t you have to wait until they reach toom temperature? Also what do you have for lunch? I don’t know what to eat while I’m at work if I can’t heat up food. Yes, in order to freeze leftovers they should cool down first to room temperature, but I would not leave them longer outside the freezer as they need to be. You can once in a while heat up food, but to reheat food may cause problems. In my experience things with a lot of protein (meat, mushrooms – often listed as bad anyway, rice, etc.) should not be reheated once they were cooked. Vegetable soup seems to be fine though. Otherwise sandwiches, rice waffles and everything that does not need cooking can be taken to work as well. I gut my fish within half an hour of catching it and freeze it in a baking tray with salt and herbs and ghee until lunch time, when i take it out of the freezer and put it directly into the oven. Works well for me. Bananas are labelled as liberators in most lists I know and once they turn brown, they also contain histamine. Sometimes fresh bananas, with no brown spots at all, are fine. I don’t really know if that works for plantains, too. 1 capsule broken into 4 increments throughout day: Twin Lab quercetin+C ( this seems a major contributing healer). If I can take less, I do. For immune support – Black seed oil, bilberry and grape seed extract (not every day). I also include local honey and molasses in my cereals, and 1/2 tsp turmeric in a mixture of olive oil, pepper, and honey (sometimes with milk), and antihistamine teas such as rooibos and others. I can’t be certain, but histamine intolerance does seem to be related to gut impairment. Before this regiment I suffered severe angioedema, intestinal and acid issues, if I didn’t take 10 mg. of daily Loratadine. I can now go for at least 1 1/2 months before a reaction. My primary trigger may be cultured dairy – which has also been removed from my diet. I hope this helps. Thanks, Cory for sharing your experiences. I am really interested in the information you have provided. May I ask: you say you can go for about 1.5months before you have a reaction; do you mean that you have come off the Loratadine and are taking the probiotics etc that you have listed and that your gut system seems to get along quite well for a while but then seems to ‘fall over’ and have a reaction? And do you therefore go back on the Loratadine to sort it out, and if so, for how long? I ask because I have been following a similar programme to you and I think the ‘fall over’ has just happened to me and I am trying to work out what on earth’s gone on because I thought I was doing so well! I just now noticed your reply. So sorry. Yes, I no longer take Loratadine on a daily basis. I only take it when I have a severe reaction involving angioedema with my tongue, lips, face, or throat. I also administer an Epipen as needed. In cases where other body parts are affected below my neck, usually my feet or wrists, I may allow the reaction to take it’s course w/o Loratadine if these areas aren’t swelling majorly. When Loratadine is necessary I take one 10 mg. tablet when I feel the reaction about to occur. Sometimes another an hour later if one isn’t enough. If the throat, tongue or areas of face are the targeted areas I administer an Epipen immediately after taking Loratadine. It usually halts the reaction. I haven’t had to visit the ER since beginning a low histamine diet. I don’t continue to take the Loratadine once the swellings diminish. Rather, I stay very, very low histamine for a few days, and I reduce foods higher in sugar and gluten. I strongly suspect these aggravate HIT gut imbalances. I don’t always know what the trigger may have been, but reactions seem consistent with the introduction of a higher histamine food I normally stay away from, or a slightly larger quantity of one in my diet. Testing the boundaries a little too far. It’s definitely trial and error, and there’s nothing like angioedema to remind one to eat accordingly. I hope this helps, and since a few months have past since your post, you’ve figured out how to re-establish a healthy histamine balance. For me, Christmas caused a few set backs, but I’m back on track. Blessings. Hi, Eva. Thank you so much for putting this out there for all of us. Is it possible I could be having a histamine reaction to macadamias, too? I’m EXTREMELY sensitive lately; not sure why, but thought I could tolerate some of these nuts, but I’ve been up all night…what typically happens after I eat a high histamine food. Just wondering, because if it isn’t that, then I have to figure out what else it is. Thanks again so much! actually from what I know and experiences Macadamia are low in histamine. But they are high in salicylates. So if you have trouble with salicylates that might be the explanation. I can recommend that page: http://salicylatesensitivity.com/about/food-guide/nuts-seeds/ on salicylate issues. Thank you so much! Learn something new everyday (!!!). Very well put article. I suggest to look into oxalates / salycilates as well as they can co – work with histamines. Do not know for other kind of reactions but if you have nervous system histamine reactions walk helps you deplete histamine because it is used by the body for motion. So a daily walk can help but even during an attack a way to manage it is to keep walking in the room. If you have sign of a reaction you may ingest ozonated water. Machines are cheap and can have many uses. Ozone oxidate histamine. Also dig into the reason of B6 deficency. B3 is produced by conversion of B6 + triptofane. So you may ingest enough B6 but if you are low in B3 your body will use all B6…gut infections as helicobacter pylori or yest infections (even bland and almost asymthomatic) can use all your B3. My comment is about a year and a half later, but… yes! Walking helps! When I feel really ill I need to lie down about 25 minutes. After that I force myself to take a walk. It makes my body calm down and my mind clear up somewhat. Probably helps with circulation, too. Thanks for sharing! Dear Eva, Can not make a long story short…I had never considered my health problems were Histamine related, as who knew, until recently. I have suffered since the 80’s and the suspects were outside sources like, environmental, then detergents, my cats, until later in life it was sulfates, then NSAIDS!!! .. just exhausted and defeated. However, I went thru all the allergy tests again & again, tested for a ‘protein’ that was negative, and to no avail, as ragweed and pet dander were the only culprits every time. Then one night, around 3 a.m. I was rushed to the E.R. as the palms of my hands were flaming hot and itchy and my back was the same, after taking Naproxen Sodium, my blood pressure was rising fast, in the 200’s. During my treatment the dr, said “I am so happy you got here when you did, as this wasn’t going to end well, I can only assume from what you have told me that you are allergic to Aspirin”. The follow up with my PCP was a joke, she just chuckled at me like it was just silly having an Aspirin allergy. Now being TAGGED with an Aspirin allergy, I had not a chance of getting the anti inflammatory’s that I needed for my joint pain, arthritis etc. Are you kidding me. Recently, I was back with an allergist after many large wheals all over my body, randomly, at the least twice a week, and dealing with it, staying home in hiding with all the facial deformity and discomfort. I blamed it on stress/cortisol, then for the second time in 7 months my TONGUE swelled to the size of my mouth and I couldn’t form words. Frightful, dreadful .. you can imagine. I (again) started to research wheat belly and wheat allergies but this time it inadvertently led me to the Histamine Intolerance Diets, food lists, stories and websites that are now my nutritional ‘bible’. Its only been a couple of weeks but I’ve seen an improvement in my joint pain, hip pain and other health problems. I am more inclined to take walks and do more physical activities than before. I’ve lost 5 lbs, probably fluids as I am less inflamed. I’ve also introduced Magnesium Oil and a supplement powder and I can tell you I see the light. This will be the longest most difficult journey, as its all trial and error and its very lonely, there isn’t a sympathetic audience for home researchers. Learning the warning signs, testing, journaling, retraining, food awareness, its just daunting, you really need to be committed, even if you can’t find the support systems. On the upside I know I will have a better quality of life. I eat better and I feel better. Doctors need tests results, and that can be frustrating as Histamine levels change every minute, from day to day. …oh and one more thing, I got the courage to take one ASPIRIN, then TWO, in two days… unsupervised, because my pcp refused to do so… result … I AM NOT ALLERGIC TO ASPIRIN!! Jury is still out on the hives but ONE DAY AT A TIME … I am worth it!! Thanks for sharing your long story. I can assure you many people go through the same odyssey. Even with us it took some time until we got to the root of the problems. But once you’re there, it’s a first relief. I especially find your comment about magnesium oil interesting as I have long suspected magenesium might help with histamine issues. We have magnesium as fizzy tablet here and this also helps when a histamine “attack” is on the rise. All the best for you! I would love taking vitamine c and zink but often there are filler in them . And vitamine c is ascorbic acid ? Is That ok ? Hi, yes some fillers can be a problem. if it’s just corn starch most people can tolerate it. we don’t use pills/supplementation. but I’ve heard many can work with zink and/or ascorbic acid. I would just not take too much vitamine c at once as the body can only absorb so much at a time. makes more sense to take several doses over the course of a day. drinking is important, otherwise vitamine c might distress your kidneys over time. we work with chia seeds (and lots of water with them), and several oils (black seed, borage, evening primrose). crushed mixture of nuts every day…..could these be the cause of the hives being worse? Thank you. Hi, do you actually have histamine intolerance or was some histamine related disease ever diagnosed with you? There are some rare cases where antihistamine tabs don’t seem to work, as they block special receptors for the histamine reaction. As far as I know there no tabs for all receptors, most tackle H1 and H2. If it actually is histamine intolerance depending on the kind of nuts (not all nuts are bad) and considering the sunflower seeds (liberators) this could be a histamine reaction. But don’t forget that allergies can bring up similar symptoms. Did you check with you doctor if you are allergic to certain foods (especially nuts)? From the distance and not knowing your story, it is hard to say anything to help you. Sorry. You say to drink water because it’s pure, but, I have problems with most water. I feel nauseous right after drinking it and many times my mouth burns when I swallow. However, I can drink distilled water but it’s not always readily available except in the form of soda and other processed drinks. I do take some distilled water in a glass container when I go to work. I can only assume that I’m sensitive to something in most water – it can happen with tap or bottled. I know I have histamine intolerance from a DNA test I took. I’m in my 60s and have had gut problems my whole life so it was a relief to find out why. The best thing about finding out I had this issue was feeling vindicated about all the strange symptoms I had that the doctors would scoff at. I would tell them that I felt so much better when I was pregnant (4 pregnancies) and they would just dismiss it. NOW I know why I felt better. I have problems with heat and cold – again – now I know why. There is only one drawback to this discovery. I can eat better now and so I’ve gained weight. Hi, concerning your water question: Many people with HIT don’t seem to be good with sulfates. You might want to check if you tap and/or mineral water contains higher doses of sulfate. Hello, a story I have to share, without going into too much detail, I had hives on my arm when my dad drove me and my mom through a bunch of purple blooming wild thistle flowers on his off-road ranger about a year ago or so in some beautiful Texas wild country during spring. After that ride I noticed small bumps forming, and the next day they got pretty itchy and uncomfortable. My mom bought me some calamene (sp) lotion which I used to make them go away. This year however, I was playing basketball and fell into some sticker patches and dried grass which hurt. I didn’t think much of it and swam in a pool, and I had lots of sausage and eggs for like that whole week every breakfast. The next day, the same arm was going crazy with bumps again, but this time they were twice the size. I got scared because they were going up the top of my left arm and up onto the top of my left hand. Calamene lotion didn’t even seem to help, so we stepped up the treatment to an over the counter drug called Benedryll spray and for kids liquid by mouth. That stuff really hit the spot let me tell you, it cleared my allergies I was having, and each spray made significant changes per day. It took me far longer than one week however to get rid of all of it. Most websites I read online said it was chronic hives if it lasted longer than that. Mine lasted nearly 3 months or so, and it left behind some scarring, because after the hives was gone on the arm, it moved down to other regions, like down my right leg, and near the privates. And you will think this is funny, because I was watching Stargate SG-1, the episode where they talk about anti-histamines, that I began to notice that word more often. I call it a miracle from God, but call it what you will, God led me to begin reading more about it. Mainly because whatever the hives is, seems to be alive and move around. I began to notice inflammation more often, it prevented me from getting sleep, it made me aggravated to touch warm things like my blood didn’t like it. Why would my blood be so hostile? I wondered. What is going on? For a long time, I thought it was just what happens when you’re slightly obese, that you just get hot. Not even close. I realized I was having overreacted allergic reactions. The hives wasn’t going away. I got off the Benedryll and they came back. So I went back on it, till the hives was completely gone as some website recommended, and then my mom bought me some vitamin C, I think because I was interested in buying supplements at the time. I immediately began feeling better. I also began to take blue green algae and a probiotic acedophalus (sp) because I had mentioned to my mom that my blood seemed to be the cause, and she thought it was a digestive problem. It wasn’t until after all this happened that I figured out vitamin C was an antihistamine and I wanted vitamin D and E to help repair my skin, so of course I began to look up about vitamins. My hives is so much better now, and the inflammation has completely stopped as I write this. Just yesterday it was kind of still there. But as I speak I have no hives, and no itch, skin is repaired (slight scarring, probably should have used a wet bandage), and sleeping much better. It feels so good to be able to feel warm things and not feel irritation. Thank God. God bless. P.S. I drank lots of soda and ate lots and lots of tomatoes and spicy hot hot peppers (more so than most individuals) which was probably the root cause, of setting up a base inflammation, with the falls and the thistles penetrating the skin being simply a trigger for setting off the inflammation. P.S.S. I wish more people knew this stuff, but then again, everything in moderation is also a good advice. P.S.S.S. After the hives were gone I went and got a stye in my eye by accidentally holding my eyelids to the carpet. Then I got a boil by taking a daily vitamin B. Those also healed and are gone but yeah I really could use less health problems this summer! HAHA! P.S.S.S.S. I love natural home food remedies! Is there a simple test one can do for sulfates? Well, I guess my elimination diet is that I don’t drink water except distilled. Thanks for your site. Why would you not take DAO enzyme all the time? If low-DAO is a contributing factor? Other things…Epsom salt baths or foot baths, B1 as well as B6. If you have MTFHR you may need methyfolate and special form of B12, Google Ben Lynch. Butterburr stabilizes mast cells, major source of histamine. Ladies progesterone cream if you are estrogen dominant. Get tested. Last 2 weeks of your cycle if not menopausal, if menopause 21 days on, 7 days off. Are nuts liberators or high in histamine? I have read mixed things. Hi Maddy, I would not take Dao enzymes all the time as for starters it only helps with high histamine foods, not histamine liberated from mast cells respectively food containing such histamine liberators. Secondly if you add external DAO all the time your body will get used to it. DAO enzyme is a therapeutical drug, it does not heal. The goal should be to heal your body, which in most cases means heal your gut. With mast cell activation DAO is basically useless. So it only helps with the classical histamine intolerance (meaning DAO deficit). But there is also a possibility of HNMT deficit as cause for HIT and then there are mast cell activation disorders (too much or too active mast cells). Besides, Daosin which is the only DAO drug available that I know of is made from pig intestines. Some people might not want to take that for religious reasons or because they are vegan/vegetarian. From pea seedlings you can make your own DAO supplement, which is also much cheaper by the way. I tend to stay away from pills and powder if possible. There are many ways to help you just with the right food. Many different kind of oils help here a lot. Regarding your nut question: It depends on the kind of nut. Some people do quite well with macadamia and coconut. Hazelnuts can work, too. Almonds, which are technically no nuts, seem to go aswell. Walnuts make problems here. Since nuts are potent allergenes they may cause histamine problems aswell if you are allergic. Most nuts are not actually high in histamine. They may contain other biogenic amines and are therefore liberators at most. This is awesome info. Alcohol always leaves me flush, unable to sleep, nose stuffy, irritated bladder, as have so many other foods. Forever I just thought I was an alcoholic, but I know my body just doesn’t like it because how the alcohol is made. I’ve seen other recommendations for probiotics, and I just ordered vsl3. How long do you recommend staying off histamine foods, and if I don’t eat histamine foods, take a good probiotic, will my gut still heal if I have a daily espresso? Hey, there are many reasons why high histamine foods and foods which promote mast cell activation might trouble you. So answering your question is not that easy. See, there is histamine intolerance which is basically a DAO or HNMT enzyme deficit, meaning you cannot break down histamine taken in with food so well. On the other hand there are mast cell activation disorders, meaning basically to active mast cells releasing too much histamine in your body. Both, the intolerance and the mast cell activation disorders can be developed or you’re born with one. E.g. from long antibiotic treatment you might develop a histamine intolerance. Porbiotics for at least 3 months and a low histamine diet for some months might help here. It’s more difficult if you were born with a less active enzyme. Then you can only manage the intolerance with low histamine foods. You can also check for nutrition deficits as zinc, magnesium and other minerals and vitamins promote the enzyme activity. So it all depends on how you got your problem. Regarding coffee: I realised normal coffee to be worse than espresso. What many don’t know: Espresso contains LESS caffeine! Caffeine blocks your DAO. For as long as you are on your probiotics treatment with the low histamine diet I would therefore rather not drink so much coffee if possible. I just checked on http://vsl3.com/about-vsl/ your product and there are at least two basteria strains in there i would not recommend: streptococcus thermophilus and Lactobacillus delbrueckii subsp. bulgaricus as they release histamine. On the whole probiotics issue: It only makes sense when you have the intolerance because of something like having to have undergone a prolonged antibiotics treatment or whatever. Because probiotics help to “repair” your gut flora. Problem is, you’ll have to find out which bacteria is actually too active and which is missing to find the right “cocktail”. Just taking any probiotic product won’t do it! I suggest you get together with your health practioner and discuss the issue. You can try it still. I’m just saying it might do more harm than good if you are actually histamine intolerant. Problem is, the other bacteria cannot break down the histamine the “bad” bacteria produce. Did you actually check the gut flora, what bacteria you might need? Really I would not just take any medicinal food unless I know this will tackle my problem. Therefore I would make the necessary tests first and then discuss with a doctor. Same goes for nutritional deficits and so on. What you can do is prebiotics like psyllium husks. These are like “food” for the “good” bacteria and therefore help nurture them. So I guess you are situated in the US. Then insurance can be an issue of course – and I get that. If you are good with the probiotic you’re taking right now, I’d say keep on with it and see how you do with it. I hope you’ll feel significantly better after about 2 to 3 months. Don’t forget about your water intake. When taking prebiotics and all that, drinking is very important. Plus, histamine is water-soluble 😉 All the best for you! So… Do you recommend liposomal vitamin c, seeking health probiotics, and a raw vegetable diet (the low histamine vegetables) for first month or so to help heal. I also got some holy basil? Thx so much! Holy basil is a great idea. Basically any green herb like sage, basil or oregano is helpful as it contains the mast cell stabilizer luteolin. Vitamin c helps to break down histamine. Be sure to drink enough to it. If your gut is still leaky / you’re suffering from the wrong bacteria I wouldn’t go for a raw diet as yet as it might exacerbate your histamine issues. For starters go for cooked veggies. When you’re feeling better you can also go raw. Prebiotics like the mentioned one or oat (there is also gluten-free oat) are also great. All the best for you. The hardest thing is i also do keto, because if i even look at a carb i gain about 5lbs!! Thx for your comments! You can go for leftovers if you freeze them right away after they’ve reached room temperature. But I recommend not to store them in the fridge. Some stuff I would exclude still, as stuff like fish, mushrooms, etc. spoils pretty fast. Don’t reheat those. When we still ate meat when bought it always fresh. HI thank you for this site. It is very isolating and terrifying trying to tackle this histamine intolerance world when drs keep saying ‘they haven heard of it and it could be anxiety. I just wanted to ask if you know of anyone who has had symptoms like me? All my research shares of people swelling, the hives, red face etc but for me when i’ve had certain foods I get a crazy tingling feeling up my entire body, very dizzy and instant panic comes over me ( I am not anxious or on any meds for anything) and I get crazy tachycardia as well as hi and low BP followed by severe diarrhea and then exhausted for the next two days. these reactions just started out of nowhere and since Aug 25 I’ve had 5 of these reactions and they get worse each time. Allergist says I have nothing, cardiologist says hearts good ( except when i was in ER for one of these ‘attacks’ and they checked me for a heart attack b/c they’ve never seen something like it before. I’m a 35 year year old mom of three littles and am now terrified to eat. I am on low histamine diet and am just wondering if anyone has any similar reactions? Hey, your issues sound quite similar to what I’ve had experienced with my man here. When he has had “shocks” in the past he complained of a tight chest, dizzy head and bad migraines. He went pale then and felt cold and hot – interchanging. His heart might start racing also and then be very calm again. Diarrhea was another symptom and if it was really bad, he might also vomit. So, I’d say, this sounds similar to what you’re experiencing. Did you have any antibiotic treatment recently? I’d recommend your doctors check your gut bacteria and also your nutritional levels (zinc, magnesium, vitamin d, etc.). It might also come from hormonal imbalances, especially considering you are just 35 now. Maybe early menopause? That’s just some ideas to go with to your doctors. Don’t let them talk you into that whole “psych ward issue”! Happens to too much people suffering from histamine-related issues from histamine intolerance to mast cell activation. Be resolute. I hope that helps you. Maybe also check out this site: http://www.healinghistamine.com and http://www.histaminintoleranz.ch. All the best for you! So any advice on what to take or do during these waves of crazy reaction would be appreciated please. Is your man still having attacks? I’m barely eating since this happened as I’m too scared. I am seeing a functional medicine dr who is doing a ton of digestive testing from stool urine and hormones so I will keep you posted. Here’s to finding a cure to this shite!! Hey Wendy, luckily that only rarely happens nowadays. Just sometimes when he doesn’t stick to his diet and gives in to some craving it might still occur. There is stuff you can do besides a low histamine diet to prevent it, like drinking tulsi tea and a like. When it’s already “too late” my man sips sage tea and takes a bath. And then tries to sleep it off. Funny enough the problems usually come up in the evening. I hope the tests will reveal what causes your problems. It’s easier to tackle it all then. yes mine is evening as well. I have read thats b/c your gut starts releases the histamine as foods that take longer to digest in the gut sit there. what kind of bath does he take? Have you heard of clay baths? wonder if they would be helpful? I just can’t imagine climbing into the bath when these shocks happen. I want to call an ambulance!! Thanks for the tip of tulsi tea I will look into it and sage tea. I think it’s the enveloping effect of the luke-warm water that kind of soothes his pain. If you’re afraid of climbing into the bath tub in that “state” maybe cold or warm (try what suits you at the moment) compresses (especially in the neck area) might help relief some pain. Plus: Please don’t panic! I know, this is easily said, but when stressing yourself out you’ll signal your body to release MORE histamine. Just try to find something that relaxes you, be it taking a bath, trying to take a nap, doing some soft yin yoga practice, meditating or listening to your favourit music – whatever works for you. Until your test results are in, you can document what you eat and how you feel afterwards in a diary. This might also help to find out the foods that “hurt” you. For inspiration there are lists on the internet available that categorise foods into “ok”, “maybe” and “avoid”. See for example: http://www.mastzellaktivierung.info/downloads/foodlist/21_FoodList_EN_alphabetic_withCateg.pdf But since we are all different individuals not everything might apply exactly as listed there. Some people don’t do well on mentioned “ok” stuff and others can do some of the “avoid” foods. Once you got everything more or less under control, you can sometimes eat “avoid” foods. Just watch out not to fill up your “histamine bucket” too quickly. All the best. You are not alone. Yes, I have had that reaction before and it’s really scary. I haven’t had such severe reactions since I’ve been older (I’m 67) and may have something to do with hormones. However, I do still get the irregular heartbeats when I eat certain things, especially food with a lot of salt in it. My heart doctor doesn’t believe salt can cause irregular heartbeats, but she doesn’t live in my body. About one year ago, I took a DNA test for family research purposes and found out I have histamine intolerance. I had never heard of it before but all the weird symptoms I’ve had my whole life suddenly made sense. It was such a relief. So if you have another attack, try to remember what you ate in the hours before the attack. For me, I found out that I’m sensitive to canola oil. It’s used everywhere so it took a long time to figure it out. Don’t give up. Well, I fell from virtue over Christmas and my symptoms returned. I’m running an experiment right now, recording symptoms and medication for two weeks on normal food, then doing the same for the diet. I’m at the end of the first week of diet right now, and have had zero symptoms during the week. I shall graph the results at the end of next week and it’s going to look rather impressive if week two is as good as this! All the best that it helps you and works out. I’ve had two tries at the histamine diet now. On both occasions there has been an initial, dramatic improvement, but unfortunately followed by a return of symptoms after a couple of weeks without any slipping from the diet or other change I can identify. Do other people have similar experiences? Hey Galen, depending on how strict your low histamine diet is, nutrition deficits can occur. Symptoms can mimick those of histamine related issues. Maybe you can get your nutritional status checked. Sometimes there are supplements needed. Another reason could be, that the histamine intolerance is actually acting as a “symptom” of another problem. Whereas a few people suffer from histamine intolerance since birth or from early childhood on, many actually develop the intolerance later in life. Many things can bring on the problem, like hormonal imbalances, leaky gut, SIBO, parasites, ongoing inflammation and quite a few autoimmune diseases like hashimoto and other thyroid issues. Once the actual reason (if there is one) is found and can be treated, the histamine issues also will subside. So it’s worth playing the “detective” to find out if there is another problem lying underneath. Trouble is, I’ve had this for 17 years now and I’ve been tested for just about everything anybody can think of – it remains “idiopathic”. I know enough about nutrition not to get deficient (I teach the subject!) and anyway, the symptoms return too soon. I’m beginning to think I should up my antihistamine dose – I’m only on a quarter of the maximum – except that I suspect that we develop tolerance to antihistamines even though the textbooks don’t say so, so it might only be a short term solution. Hey Galen, there are quite a few diseases which promote certain nutritional deficits. Sometimes they are hard to diagnose, just as histamine intolerance itself is. So, apart from the diet you’re also taking antihistamines on a regular basis? Well, I always suspected the body gets accustomed to enzyme supplements like daosin, but maybe the same is true for antihistamines as well? Another thing might be overly active mast cells, as it happens in mastocytosis. So you don’t actually take in too much histamine with food, but actually produce too much yourself. The treatment for mastocytosis is somewhat similar to histamine intolerance, just the focus shifts a little. It certainly helps not to strain the DAO enzyme too much with high histamine foods, but more importantly the HNMT enzyme should not work overtime. So it’s important to keep the “liberators” in check. People with mastocytosis often react more strongly to foods (and especially additives) that promote histamine release in the body, like carrageen does for example. Inflammatory foods are a big issue. People with mastocytosis are also very sensitive to environmental factors like UV-radiation, heat, cold, stress, etc. which all promote histamine release. Have you ever thought in this direction? Have you noticed that you react to strong sun, sports, and stuff like parfume with headaches, migraines, heart pumping, etc.? Try having a DNA test done by 23andme. This is how I found out I was genetically “imprisoned” by this problem. Before this test, I had never heard of histamine intolerance but it certainly explained a lot of things that were wrong with my gut my whole life. this is amazing! i have a severe urticaria because of histamine intolerance. i have made so much research! and no list is ever good enough because they are always to forgiving in the selection. But yours is amazing! this has truly made my day! i´ve done a lot try and error and is really frustrating, sometimes it pushes me back. i had a lot of doubts about options and replacements. thank you so so much for gathering all this info and organize it so neatly! Hi Samantha, I finally updated the list. We used to have big trouble with olive oil, until I changed the brand. Now we are really happy to have it back for frying as coconut oil does not fit to everything. Coconut oil is safe here. But it can be a trigger of course for people with nut allergy or suffering from other intolerances (salicylate). Corn oil we generally don’t use. And it is also not on my safe list (also wasn’t before I changed it now). Organic corn for eating works in small amounts though. Most corn oil is not organic. PS: Never get hung up on the lists. You can use them for inspiration of course, but in the end you’ll have to make your own by testing out foods with a food diary. Problem is, we are all a bit different. And when other diseases/intolerances/allergies … comes in it really gets complicated. To just kick out a certain food because it is listed somewhere is not the way to go. You might end up with very little variety and deficiencies in the end. Try to substitute rather than eliminate. This puts together much that I have read over the last six years. The Swiss site is definitely the most comprehensive, but all lists are only guides. There is one subject on which I can find no information: water. I have my HIT much better under control in Germany than in France, where our tap water is undrinkable, and we buy warwe in glass bottles.Sticking to the same range of foods in both places, I have come up with bottled still water as a trigger. PET? And yet I have no trouble with Badoit. Do you have any knowledge regarding this? P.s. Be careful when frying with pure virgin olive oil, the changes caused by high heat can raise risk of cancer. funny enough, recently I started looking into that whole water topic myself. The Viennese tap water seems to be really good as long as the pipes were renovated in the last decades. We realised some time ago that we still had lead in the kitchen pipes. When troubled with tap water you might wanna check out the mineralisation and maybe a filter can help. There should be low to no fluoride, low to no nitrates and low to no sulfates, otherwise you may experience troubles in our experience. Badoit fits those criteria quite well, although nitrates could still be lower. Also look for relatively high magnesium and calcium counts (best is a relation of about 1:2). Of course PET is not healthy, yet since water is not bottled when heated I think the particle traces in the water really are not noticable. Although we also prefer glass bottles, which nowadays are more and more hard to come by. Thanks for the info regarding olive oil. It’s true of course. The most heat-stable oil is coconut oil, but that does not work for everything tastewise. I’m so glad you mentioned problems with water. I just recently found out from a DNA test that I have histamine intolerance. I had never heard of it before the test. It explains a lot. Amongst other things, I’ve always had problems drinking water. I would start to feel an upset stomach coming on right after drinking water. People used to always tell me that it couldn’t possibly be water because it’s so good for you and one should drink lots of it every day. I can only drink distilled water without feeling bad afterward. You cannot find bottled distilled water in anything less than gallon jugs so when out and about, I drink cola products made with cane sugar. It helps with my digestion and is made with distilled water so it doesn’t bother me. Of course, it does nothing for losing weight but, at least I’m not nauseous. And by the way, speaking of oil, I found long before I tested positive for HI that canola oil is death for me. Is it something that bothers a lot of others with HI? Hey ya, water is actually especially great for HI as histamine is water-soluble. So drinking water helps “wash” out excess histamine. The problem is, sometimes there are particles in the water that can work as triggers for some. I think of fluoride, nitrate or sulfate here. So even if drinking distilled water seems to be the easy solution, it actually does not help hydrate your body as mineral water would. You need potassium, magnesium, calcium and all those things for your body to work properly and mineral water is a great source. If the carbonic acid bothers you, try a mild or still version. But really, I would not recommend drinking distilled water that was stripped bare of all minerals. And cola drinks are a different issue again. It’s true once in a while these things can actually be helpful with digestion, but there are healthier ways to go about that (with less sugar). Cola also is a caffeine source and may bother some because of that. We stopped using canola oil a long time ago, as it really is not made for frying. In other countries canola oil often is made from GMO seeds and so you’ll have the “double trouble”. I read on the Swiss site that Nettle tea is not recommended. I’m confused because I thought that was a beneficial drink for histamine intolerance. Nettle tea really is quite controversial, because yes, it contains histamine by nature. The plant urtica (nettle) after all lends its name to problems like urticaria (hives) which are also a symptom of allergic and other histamine reactions. On the other hand, nettle is a known mast cell stabiliser, and in that sense even beneficial for some. So it really depends. Does that help you in any sense? I don’t think you should call water neutral. It depends upon the source. Spring water can contain all kinds of minerals etc. that some people react to. The only truly neutral water is distilled. You’re right that distilled water is neutral, but of course, also contains less nutrients. There are so-called essential minerals that your body needs, and as mentioned before, mineral water is a great source. You should just watch out for excess sulfate, nitrate or fluoride (which are all not essential anyway!). Tap water is usually safe to drink in countries like Austria (where I live) or Germany. Just watch out for old plumbing containing lead. You can also use filters to purify your tap water. Distilled water is still liquid and neutral, but to really make use of the water, your body needs certain minerals like potassium and so on. This was very interesting and informative. And I have read a lot so far! I know that I have HIT for about 3 years now and feel a lot better than I did. What helped me were supplements like quercetin and eating a lot of quercetin containing foods, probiotic l-plantarum because it has anti-histamine properties (I get mine from amazon.co.uk because they are cheap and good), calcium supplements – calcium grabs the histamines and throws them out, some vit. C, zinc supplements, methionine supplements – they degrade the histamines, a bit of silica – too much causes problems with nutrients assimilation. My biggest success was and is Epsom Salts in a bath which I do 2x/week now since December 2016. Magnesium, selenium (as in Brazil nuts) and manganese are mast cell stabilizers. Ever since I have expanded my very limited diet a good bit, especially with almonds and Brazil nuts. Recently I tried pistachios for their high B6 levels and find them pretty good. I also eat fats like butter, olive oil and coconut oil now. I can’t eat greens because of their high levels of oxalates which bring up the histamines. Last week or so I came across BDNF, an amino-acid-like substance or so. If that is low you would have histamine and other problems etc. If you increase BDNF, you would in time get rid of HIT. I think there is something to it but I haven’t quite understood it all yet. Check it out for yourselves! Another very good read is Alison Vickery re HIT. Best wishes to every Hit person! Great stuff. Lately I’ve gathered much of that information you’ve just summarised so nicely myself. I just haven’t had the time lately to edit the page. The only thing I’d like to add is that vitamin b6 not necessarily helps with histamine. Yes, it is a DAO-co-factor, but it is also a co-factor for HDC, the enzyme that makes histidine into histamine. So, if one does not actually have a vitamin b6 deficit, I would not supplement it. Personally, I find B6 supplements difficult. But some foods high in B6 are okay. Maybe because they have other nutrients counteracting the problems. There are HDC lowering foods as well like e.g. apples and green or white tea. The body does need B6. The BDNF seems a good way to go to be generally healthy. I was wondering if you can help me. Towards the end of last year, I had an allergic reaction to an Antidepressant called Sertraline/Zoloft and I was eating eating high histamine foods, drinking alcohol and I was also smoking cigarettes and believe that I have ended up with too much histamine in my system as I read that Zoloft can cause a low level of DAO. After going to a heap of doctors with all my symptoms and getting no answer, I googled unexplained itching and it came up with a histamine intolerance. After reading about it and all the symptoms it all made perfect sense that this is what was happening. I went to a naturopath and took some natural products as I had a leaky gut and a lot of toxins in my system and was told to stay away from gluten, dairy, sugar and packet foods. I also started to take Quercetin in which really helped me a lot. After doing this for a month, I started to get better, it felt like the amount of histamine was gradually reducing. In early June, I pulled and strained my stomach muscles and rubbed voltaren gel on them and now it has caused some major digestive issues and it feels like everything has actually swollen up everywhere that I put the voltaren. I didn’t know that I should stay away from anti-inflammatory products and was wondering if you know what I can do to put everything right again. I really hope that you can help me as I don’t know what else to try, I’m at my wits end with it all and no one seems to believe me about any of this and help me (even my family) especially about what the voltaren has done. I do have an immunologist looking into to it but I just feel as though he won’t know what to do either. as far as I know Voltaren (Diclofenac) is a histamine liberator causing your body to release histamine from the mast cells and that of course can cause troubles, especially when you are already suffering from histamine intolerance. To start with, your medical history is quite complex and I’m not a doctor, so I’m not qualified to give you medical advice. I can, however, drop my two cents as a matter of opinion. Anti-inflammatory medicine or even natural anti-inflammatory agents are not bad per se as long as they are not acting as histamine liberators. There is probably no quick fix to your problem. I just can recommend you to go on your healthy path: Quit smoking, get rid of the anti-depressant and stay away from alcohol. Try integrating healthy foods back into your diet that are rich in vitamins and minerals. Quercetin and vitamin C (e. g. in acerola powder – please without maltodextrin!) can help you along the way. There are also quite a lot of foods helping with the whole “histamine action”. Some of our favourites are blackseed (also the oil! ), chia seeds and sage (e. g. as tea). Sage is also anti-inflammatory and acturally histamine as inflammatory agent itself can be limited by the right anti-inflammtory agents. You might want to check out the Healing Histamine website by Yasmina. She has written quite a lot about the inflammation connection. The other thing you might want to look into with your immunologist and/or naturopath: your gut flora! Is there a bacterial overgrowth due to all the toxins that strained your digestive system? Prebiotics like oats and the right probiotics (check what is actually missing before taking any probiotics!) might help here, especially bifidus bacterial strains are often recommended with histamine intolerance. I hope that helps you along. Stay healthy and happy! Thanks Eva for your reply. I stopped the anti depressants straight away but it had already caused a low level of DAO. I quit smoking and alcohol in January and was sticking to my low histamine diet when I hurt my stomach muscles from exercise. The voltaren emulgel has definitely made everything swell up and cause major digestive issues. The immunologist has no idea what to do. I don’t understand why voltaren actually made things swell up…it’s like my body had a reverse reaction to it. I feel as though my body is continually having an allergic reaction to the voltaren as I now have been getting all the allergic reaction symptoms constantly. It kind of feels like the gel is stuck on the internal tissues. The swelling doesn’t seem to go down and when I over use those muscles, I get a burning sensation as well as the muscle swelling up even more, I think that it has even caused a stomach ulcer. It’s really got me worried. Hi, just found this and it’s an amazing piece of work, thank you for putting it all together so neatly. I’ve now been on reduced histamine for 4 months, luckily I’m not too bad, but I am the classic peri-menopausal like apparently around 80% of us. I have a thousand questions and a dozen suggestions to add but I’m intriqued by the heparin connection. Could you explain more and perhaps whether heparin as a drug might have potential in HIT treatment? I do have a couple of specific cases but don’t want to discuss them in public. Thanks. Has anyone found an MD in the US who can test for & treat HI? I saw an MD in Chicago who said I have mast cell disorder & I take Cromolyn Sodium which is helpful, but doesn’t really take care of a strong reaction. I want to be tested for DAO & HNMT dysfunction and she doesn’t do that. I’m thinking of travelng to Bonn to see Dr. Maintz. Also, has anyone tried freeze dried meat? If it works for you, where did you find it? I’d like it for a quick meal or for traveling. Here’s a food which works well for me: tiger nuts. Readily available online. Can’t say that I love them, but I tolerate them & they’re a great go-to snack & good for traveling. Looking forward to learning more from this blog. Take the DNA test at 23andme – that’s how I found out I had histamine intolerance. You have to do a little digging into your gene report but, since you know what you are looking for already, it won’t be difficult. That gene testing gives you a clue, but a certain (e. g. MTHFR) defect can also mean mast cell activation disease. So to check for histamine intolerance you should combine different test methods like DAO activity (blood work) and methylhistamine in stool. In the end it is still difficult to tell histamine intolerance and mast cell activation apart, but luckily, the therapy is similar. Whereas people with histamine intolerance tend to tolerate trigger foods (liberators) better than high-histamine foods, it’s the other way around with mast cell activation, although, in large quantities both kind of foods can do both harm. Has anyone seen Dr. Anne Maitland in NYC for treatment? Hi Nick, how do you do with sunflower oil and seeds? I’ve listed them as liberator/trigger food, meaning they themselves don’t contain much histamine, but they can trigger your body to release its own. Depending on the amount ingested, one might react. Yet, the binding agent sunflower lecithin in a supplement will not amount to much. So, if everything else in that product is safe with you, you’ll probably tolerate it. I hope that helps you. Hi, it was long time I lived with the stomach pain till we discover that my menopause caused histamine intolerance. Actually what helped me was bowen therapy. Just find one qualificated terapist in your area and you will be amazed. Good luck to all! What has been your most tolerable way of consuming them? I saw you avoid beans that need to be cooked but the only other way to eat legumes would be canned. We do best with legumes that don’t need to be cooked, like peas. The reason being that other legumes contain more ATI, phytic acid and other substances which you’ll have to eliminate by soaking and cooking first. Some people just sprout. Sprouted peas set under stress (no light) produce DAO, and can actually be quite helpful in that sense. When we use canned food, which is seldom, it is usually in glass jars not actual cans – that goes for corn for example. Generally it is best to go for fresh ingredients or stuff from the freezer and avoid canned food. Hi and thank you for the information. From my experience HI is a well kept secret and one needs to do some dedicated digging to learn about it. I’m a 61 y/o male who’s drank coffee most all my life and for the most part was my drink of choice. I drank it all day every day. Starting around 5 or 6 six years ago I started to get red itching in my groin area which I thought was a result of sweating and irritation when riding my bike. After a couple years I figured it was jock itch but everything I tried barely only helped the symptoms. Then a couple years later I broke out in different areas, legs, chest, arms, etc. so I thought it was eczema. So now I go to a dermatologist and get a prescription that’s good for the rash but it keeps coming back. Now I’m thinking this is more of an allergy so I eliminate different foods until the only thing left is the coffee, so when I stop that it all goes away. Right away. I get the rash from drinking regular or decaf coffee both AND black tea. So I guess the moral of the story is you can consume something for years and years and still develop an allergy or intolerance to it and it can also manifest itself slowly also which you only see in hindsight. Hope this may help someone else.